Turf Hacker: Spot Spraying and Counting Disease. 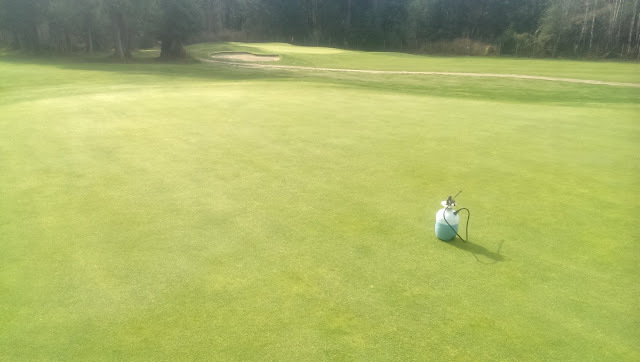 Spot spraying has been a big part of my IPM program for the last few years. I hypothesized that winter diseases like fusarium on the coast aren't really that bad, we just make them worse by spreading them around. In order to capitalize on this theory I have been spot spraying my greens with traditional fungicides to attempt to limit that spread. During the time that I have been doing this I have never had such success managing my nemesis, fusarium. On the surface, spot spraying seems like a pretty simple and basic tool. See disease, spray it. 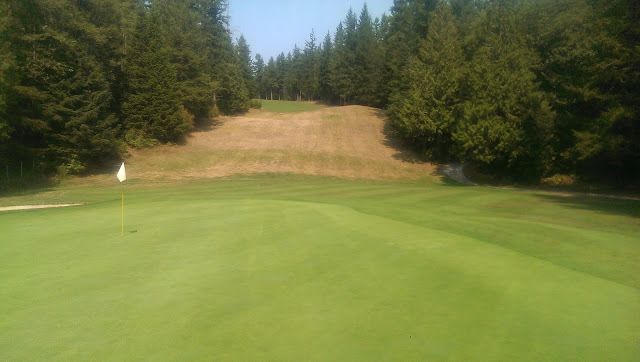 The problem is that it takes time and if it doesn't help you stretch the intervals that you need to apply a broadcast fungicide spray, then there is little point in doing it. 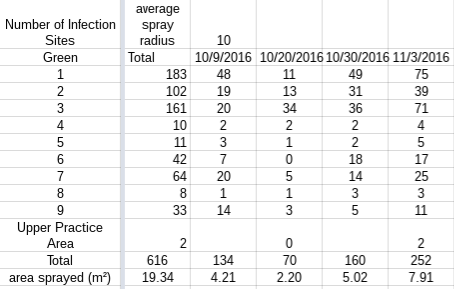 Where spot spraying really becomes a powerful tool is when you count and record the number of disease spots that you treat each day you spot spray. Counting and recording this data doesn't take any additional effort unless you find counting difficult. It does require that you are consistent in your data collection on all greens. Only doing one green or two won't give you as good of information as if you do all your greens. For me, the time commitment is about 1 hour to treat my 0.4ha (1 acre) of greens. In the past month I have spent 4 hours of time spot spraying, $0.25 in fungicide and have required no broadcast fungicides on my greens. I typically spot spray once a week (or the day before mowing) through the winter when fusarium is active. I then record the number of spots in my google form on my phone. My form is simple and very quick to fill out and this makes it easy for me to be consistent in my data collection. Counting disease on my greens gives me a very good idea of how bad the disease is and when combined with data from previous spot sprays, I can roughly determine the disease pressure and how that is changing over time. This gives me an idea of when my fungicides are wearing off and what impacts my maintenance practices might be having. It also lets me determine without emotion, when I should spray. Emotion is a huge driving force behind determining when to spray especially when you don't have a good quantitative figure on how bad the disease is. It is easy to panic when you see a few spots of active disease here and there but after a count you can see how bad it really is. This simple fact has helped me put off countless fungicide applications for a week or even a month or more! To measure is to know. 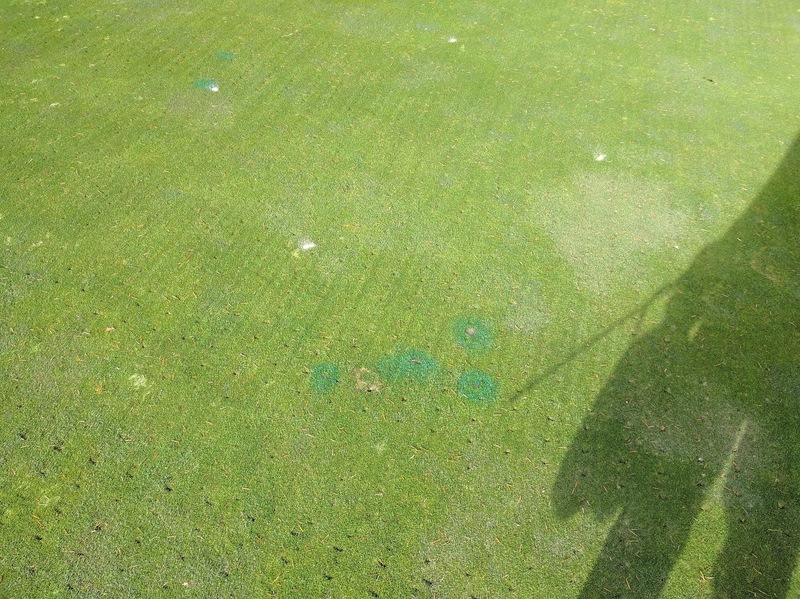 In order to prevent double spraying spots it is important to include a pigment in your spray. As the pigment fades and you come out to spray again it is very obvious which spots have been treated already and which ones are fresh. The human eye is a very powerful tool and after a while you will be very good at determining if disease is active or not. I can look at the data collected and see which greens are the worst. As you can see on the table below, the first 3 greens have the most disease. As you go from one spray date to the next you can also see that the amount of infection sites is getting worse over time. The last broadcast fungicide was applied on September 24. 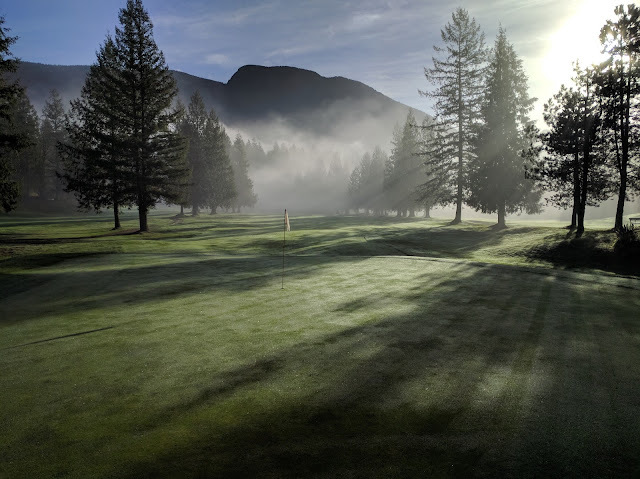 This kind of information can give you a great idea of which greens have the worst disease and can allow you to focus on why certain greens get more disease than others and possibly make changes to reduce the disease pressure on the trouble greens. This data alone, however, doesn't give you a good idea of how bad the disease really is and how it is changing over time because it doesn't take the interval between disease counts or the area of each green. 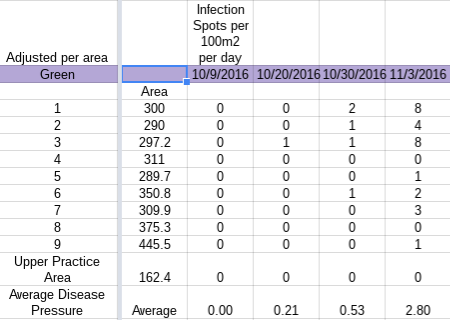 The following table shows the number of infection spots per 100m2 per day. This information gives you a better idea of what the disease pressure is. As you can see the 1st and 3rd greens have about 8 new infection sites per 100m2 per day and that overall the number of infection sites per given area is going up at time goes on. Basically the disease is getting worse. But why is it getting worse? Is it the weather? Fungicide wearing off? Or is it because of disease spread by mowers? This is important to know because if the majority of disease spread is by mowers, then a simple spot spray should end the disease pressure increase as long as you aren't mowing like crazy. After a period of time following the mode of disease spread the disease pressure should drop. If it doesn't the disease pressure is probably environmental and a broadcast fungicide will be needed. So you can see that my disease pressure is rising but why? The picture below shows a cluster of disease around an old disease scar. Clearly I didn't spray this spot soon enough and it was spread by our mowers. The time it takes between when the disease is spread to when you can see it varies but seeing this can help you determine how long it really took. In the case below, was taken 7 days after the last mowing. The pigments allow you to look back after spraying to see patterns in the disease and this also helps you determine just how bad the disease really is. A further out view of the above picture shows that this disease outbreak is isolated and the result of mower spread and not environmental pressure. Please excuse the holes and fir needles. This was the day after deep tining greens after a heavy wind.. The transition from summer to fall is always a difficult time because the grass needs to be mowed more than one can spot spray. We are also often mowing in the rain but cannot spot spray in the rain as was the case last week and why we saw a spike in disease spread. As the Fall and Winter progress and our mowing frequency decreases we can get more effective spot sprays out before we have to mow and further reduce the chances that the mowers will spread the disease on our greens. So with observations such as this, I can hold off with a broadcast spray confidently because most of the increased disease pressure is because of our last mow last week. Since that mowing the disease has had a lot of time and ideal conditions to infect the grass and grow to a point where I can see it and spray it. I have done 2 spot sprays since the last mowing and expect to do anywhere from 1-15 spot sprays (depending on growth rate) before our next mow. As time goes on I expect the disease pressure to drop without a broadcast fungicide application because we aren't spreading the disease around. I think a lot of people who try spot spraying don't do it for long because they aren't getting the full benefit of spraying each individual spot. 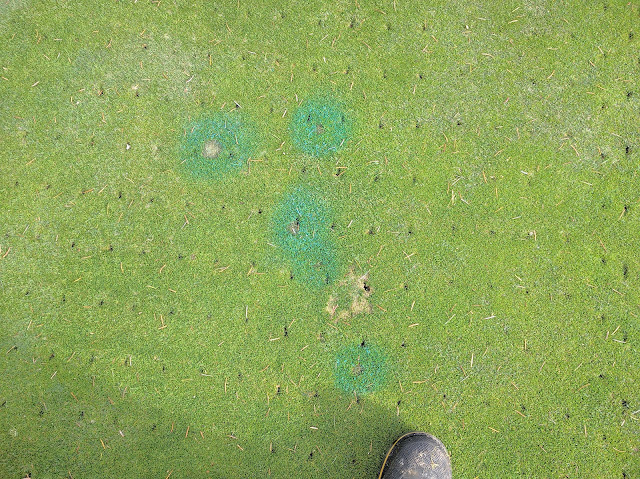 By counting and visualizing the disease on your greens you can get a better idea of why the disease is so bad and better determine when a costly broadcast fungicide application is needed.